Since its detection in 1998, the exotic aphid pest, Essigella californica Essig (Hemiptera: Aphididae) has caused extensive defoliation in commercial Pinus radiata plantations throughout Australia. A total of one hundred and twenty plots encompassing thirty tree ages, and three thinning treatments were established in September 2006 in southern New South Wales, Australia to assess crown health and tree growth. 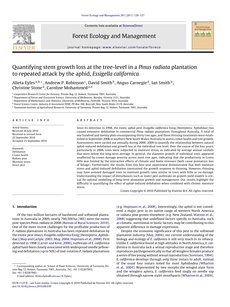 Assessments were carried out annually during 2006�09 to quantify the relationship between natural aphid-induced defoliation and growth loss at the individual tree level. Over the course of the four years, particularly in 2006, trees were subjected to moisture stress, as indicated by average annual rainfalls that were below the long-term average. In general, the diameter growth of individual trees appeared unaffected by crown damage severity across most tree ages, indicating that the productivity in Green Hills was limited by the interactive effects of climatic and biotic stressors (both cause premature loss of foliage). Furthermore, the results from this four-year experiment demonstrated that both moisture stress and aphid-induced defoliation constrained the growth response to thinning. However, thinning may have assisted damaged trees to maintain growth rates similar to trees with little or no damage. Understanding the impact of disturbances such as insect pest outbreaks on growth yield models is critical for optimal modelling of long-term plantation growth and management. Our results highlight the difficulty in quantifying the effect of aphid-induced defoliation when combined with chronic moisture stress.